Critical Chain Project Management (CCPM) alone is not enough to drastically reduce a project’s duration and improve the development process efficiency. CCPM is a proven Project Management approach to ensure a project, any project, will meet its finishing date without compromising quality nor any of the requirements, and even though CCPM can lead to terminate projects earlier, CCPM alone will not squeeze out all improvement potential still hidden in the development process. What CCPM does well is reconsider in a very smart way the project protection against delaying. Individual protective margins will be confiscated and mutualized in a project buffer, allowing everyone to benefit from this shared and common protection. There is a bit more than this protective project buffer, but for the sake of simplicity let us just be that… simple. The visual progress monitoring with a Fever Chart will provide early warning if the project completion date may be at risk and help spot where the trouble is. 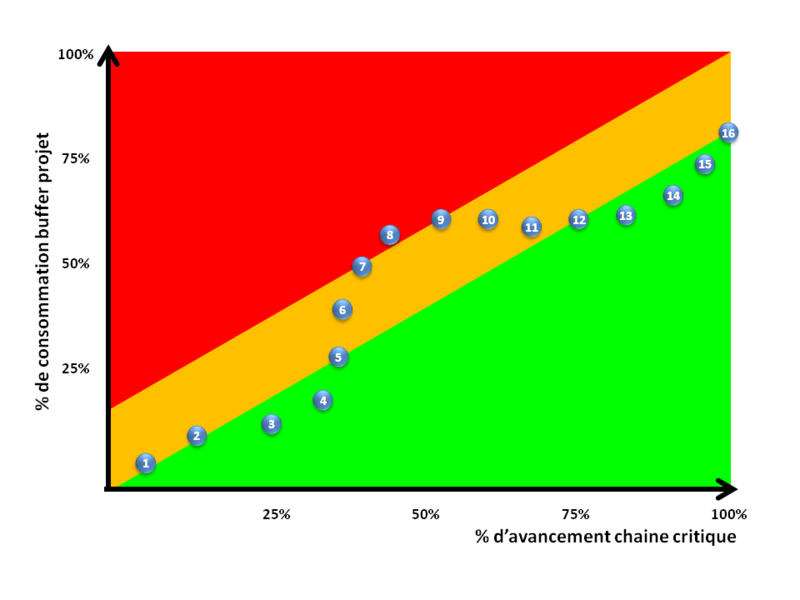 Fever Chart in a nutshell: x axis = project completion rate, y axis = protective buffer burn rate. Green zone = all ok, don’t worry, Amber zone = watch out, the project is drifting and finishing date may be jeopardized. Red zone = alert, project likely to be delayed if no action bring the plot into Amber and preferably Green zone. After a while, with the proof that all projects can finish without burning up all the protective buffer, meaning ahead of estimated finish date, this arbitrary margin confiscation can be refined and some tasks durations trimmed down while fixing some of the common flaws in the process, like incomplete Work Breakdown Structures, poor linkage between tasks, ill-defined contents or missing requirements. When done, the projects may be shorter because of lesser of the original protective margins and the other fixes, but the tasks themselves are seldom challenged about their value. For instance, many of the project’s gate reviews have been set to monitor progress and give confidence to management. They were countermeasures to the drifts and tunnel effects, the period where management is blind about the progress, but with the early warning and easy visual monitoring through the Fever Chart, and more agility in the process, many of these reviews are now useless. Thus, the time to prepare the documents, KPIs, presentations and attend meetings can be saved for value-creating activities or simply eliminated. Other tasks may clutter the project, like legacies of fixes of older issues, long obsolete but still kept as the project template still carry them over. Evolution in technologies, unnecessary or suppressed downstream process steps, never fed back may also let unnecessary tasks in the project. This is where a Lean Thinking approach completes CCPM, challenging the Added-Value of each task, questioning the resources required (both in qualification or competencies and in quantity) and even the linkage to preceding and following tasks. When considering a development process, embracing Lean Engineering can even go further. Lean Engineering fosters learning and reuse of proven solutions. Libraries of such solutions and ready-for-use modules can save significant time, which can be reinvested in experimenting for the sake of further learning or to shorten projects and engage more development cycles with same resources and within the same time span. ← What is Negative Branch Reservation?